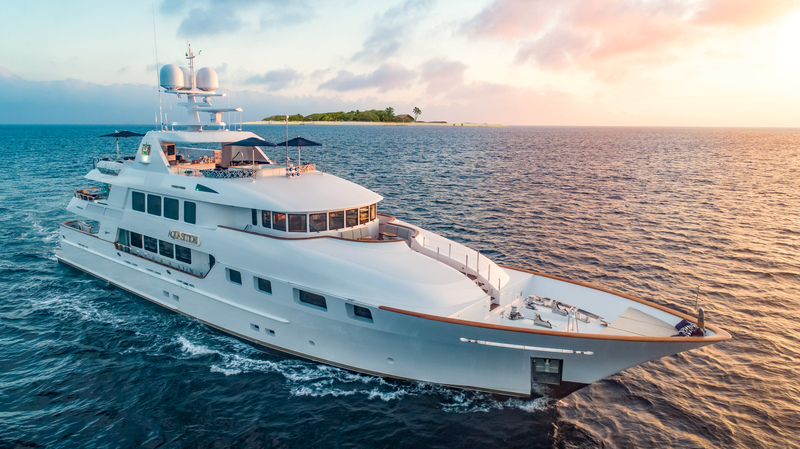 AQUASITION, the 2010/2018 142' Trinity Tri-Deck Motoryacht has had a major $1-Million price reduction, bringing her new asking price to $16,900,000. Makes sure to see this pristine 142' Trinity at next month's Miami Yacht Show, February 14th through 18th! Built for a knowledgeable yachting connoisseur AQUASITION's attention to detail and subsequent maintenance and recent refit improvements are spectacular. This is a remarkable yacht offering elegance, yet comfortable, spacious accommodations and desirable layout for both family cruising and charter. Her layout features (5) staterooms for up to (10) guests. Her elegant Even K Marshall interior features cherry wood joinery with maple burle inserts throughout. Refit in 2018 by Architectural Interiors with new furnishings, decorative lighting and LED recessed lights throughout, updated audio/video system, new carpeting, window treatments, new stone, fine silk fabrics and soft goods throughout. In addition, new exterior teak furnishings, new upholstered cushions throughout and new Tucci sunshades installed. For more information on this fine vessel please click here!